The Dodge SRT Viper Speaker Upgrade (replaces y our current speakers) offers a more vibrant stereo sound, bigger bass, and cleaner highs. Upgrade from 9 speakers to 18, the same as the production Harmon Kardon system. 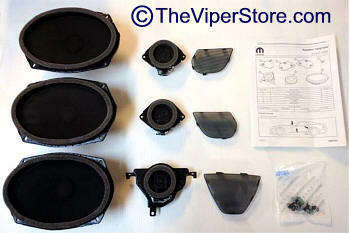 This upgrade will definitely enhance the sound system of your Viper! Includes center dash speaker, door speakers and grilles and subwoofers. "I still can't get over how good the factory 18 speaker stereo is, especially when connected to your ipod/iphone. SRT and Harmon Kardon really knocked it out of the park with the stereo. The clarity and bass is something you would NEVER expect from a Viper, to the point that even other Viper owners will ask if I have an aftermarket setup! Best upgrade I ever did." WOW! What a difference in Sound Quality! 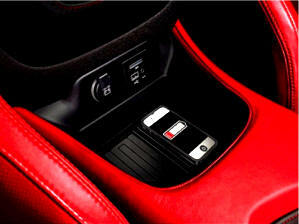 Upgrade your Dodge SRT Viper's interior and welcome the convenience of wireless cell phone charging! This Charging Unit easily installs in the your Viper and will provide a built-in charging grid that is activated when your cell is placed on the pad. The unit begins to charge when your Viper is started. A phone case, specifically designed for a variety of smartphones, is required and included in the price. Use the voucher to redeem your specific case.